Please contact the owner directly @ or 814-907-1679 ppost54@comcast.net…Excellent Condition. 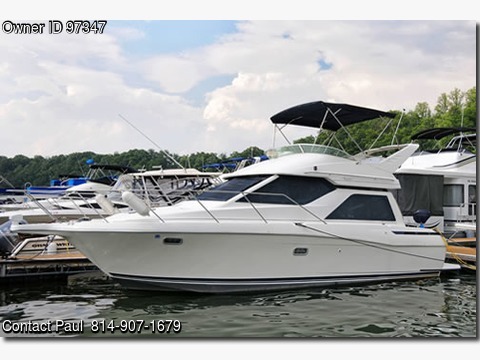 This 1999 Avanti 3258 is beautiful and loaded with options. You can pilot from the flybridge or inside the cabin. Cabin has heat/air, privacy curtains and tons of storage space; full kitchen with 2 burner electric/alcohol stove, sink, AC/DC refrigerator/freezer, microwave; dinette area which can be converted to bed; 2 full staterooms, master stateroom has closet and drawer space; full bathroom with separate shower stall. Powered by two 250 hp Mercruisers. Fire suppression and battery charging system in engine compartment. Other options include gas generator, windlass anchoring system, propane grill and flat screen TV. Boat is set up to spend several days at a time comfortably out on the water. This is a fresh water boat at Lake Raystown Resort.